View all flights, without a flight #, by clicking on the "All Flights" link above. An informed traveler is a relaxed traveler. Here are a few things to know about flying with BWI Marshall Airport. It's easier to park than ever. We have five great options to provide you with the most convenient fit! An organized traveler is a stress-free traveler. 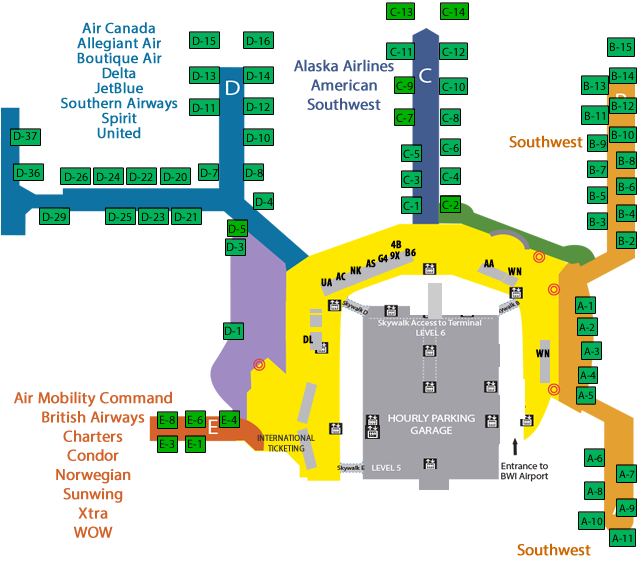 Here are a few things to know about flying from BWI Marshall Airport. Get the latest news, facts, and press at BWI Marshall Airport. The Baltimore Sun reviews some of BWI Marshall Airport's growing offerings for a luxury travel experience, along with a slew of craft cocktail bars, elevated dining options and upscale shopping venues. Low fares, convenient parking, modern terminal and an “Easy Come, Easy Go” reputation make BWI Marshall Airport your best travel choice. Travel easy with 15 airlines, 90 cities and 680 daily flights. Read more about the BWI Marshall Irregular Operations Contingency Plan.